The premier of Alberta, Alison Redford, has released a stinging news release on the conditions outlined by British Columbia for pipelines crossing the province and tanker traffic on the coast. Political analysts are interpreting Redford’s statement with its references to “free trade” as meaning that Alberta has rejected BC’s demand for a “fair share” of energy revenue. The Globe and Mail quotes Alberta’s Official Opposition leader, Danielle Smith of the Wildrose party, as saying BC . should be looking for more money from the federal government. In Ottawa, the pro-pipeline Minister of Natural Resource, Joe Oliver, issued an unremarkable statement promoting responsible resource development that managed to avoid mentioning the BC announcement; a statement that could be regarded as a classical press release that says absolutely nothing. Alberta is committed to building our country and cementing Canada’s position as a global energy superpower. Leadership is about working together, and that’s when our country benefits from our energy economy. Today, the Government of British Columbia released a list of requirements to be met to satisfy their concerns about the perceived environmental risks associated with the Northern Gateway Pipeline. Every Canadian, no matter what province they call home, expects that energy development is done with a high degree of environmental safeguards. This is why a rigorous environmental review is underway by the National Energy Board. It is why the company involved has committed an additional $500 million for increased monitoring and safety measures. These efforts, combined with the fact that pipelines are still by far the safest means by which to transport oil, significantly mitigate the environmental risk and weaken the BC government’s argument for compensation based on potential risk. As Alberta has said repeatedly, and as we saw in the recent report from the Senate’s Energy, Environment and Natural Resources Committee, accessing new energy markets is a national imperative. It is essential for the economic benefit of Canada. Our confederation works as well as it does because of the free flow of goods and products through provinces and territories—including forest products, oil, liquefied natural gas, potash, uranium, grain and manufactured goods. We’ve worked very hard through our New West Partnership to ensure free trade across the BC/Alberta/Saskatchewan borders and the shared economic rewards have been great for our citizens. In an example of how nasty American politics is infecting the Alberta provincial election, an anonymous Twitter account that apparently promotes the Wildrose party has brought the American “birther” argument into the campaign. 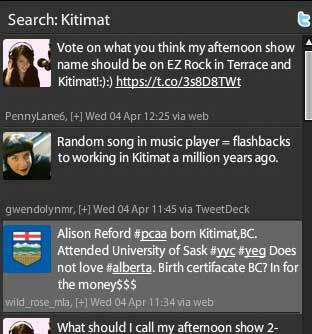 The badly written, poorly spelled,Tweet showed up on this morning’s Kitimat Twitter search feed. It implies that Alison Redford will not be a good premier for the province because she was born in Kitimat. While the @wild_rose_MLA account, at this point, has only 20 followers and 20 following, it seems to be adopting the right-wing argument from the United States that President Barack Obama is not eligible to president because, despite conclusive proof that he was born in Hawaii, Obama the “birthers” believe he wasn’t born in the US. The following day, Smith issued a statement. “In the last day the question has been raised about why I don’t have children,” and then told how Danielle Smithand her husband David had wanted children, had tried fertility treatments, but were unsuccessful. Wilkie later resigned from Smith’s office. The irony, of course,is that in her role as premier of Alberta and as a prime promoter of the bitumen sands and the Northern Gateway and other pipelines, Redford has shown no indication that a Kitimat point of view actually has any influence on her policies and platform. Her family left Kitimat when she was a toddler. This Twitter account is likely the efforts one highly-partisan individual who favours Wildrose, or, because it is so strident, perhaps even a disinformation campaign by an opponent. One reader has suggested it is a parody account. On a wider picture, however, this tweet is typical of the thousands of tweets seen over the past couple of years that shows a general ignorance about Kitimat, if not outright contempt, that seems to prevalent in Alberta political circles. For those Albertans, Kitimat is simply the predestined outlet for the bitumen sands and nothing more.